The Raystown Field Station provides education opportunities for undergraduates through regular campus-linked and summer session courses. The Station also provides continuing education opportunities for teachers and other interested participants through our outreach summer workshop series. For more information, follow the links to the specific semesters. How do I fit the Field Station into my POE? Offered in partnership with Saint Francis University. These semesters focus on ecology and environmental science with the curricular theme alternating between aquatic and terrestrial ecosystems on a yearly basis. Students conduct group field research projects that are centered on the semester theme. All students participating in this semester receive an IC wavier on their Juniata transcript. Students are expected to take the entire suite of courses offered unless previous arrangements are made with the RFS program director. Traditionally offered during the month of June. Focuses on providing students with specialized zoology courses targeted to meet certain requirements for students seeking certification as an associate wildlife biologist from the Wildlife Society. Students may opt to take one or both courses. Housing is optional at field station. Occasionally, additional field ecology courses are offered as well. Registration for the summer semester occurs the normal spring registration period in March. There is not a formal application process. 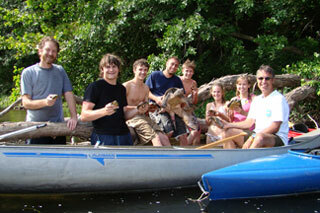 Non-Juniata students are welcome to enroll in Field Station courses. Please contact the Field Station office at rfs@juniata.edu for details. To register for Juniata classes, use the visiting non-degree registration form. This can be found at the bottom of the student forms page.